Richard Branson was born in 1950, and educated at Stowe School, where he established a national magazine called Student at the age of sixteen. He started a Student Advisory Centre aged 17 to help young people. In 1970 he founded Virgin as a mail order record retailer and shortly thereafter opened a record shop in Oxford Street, London. During 1972 a recording studio was built in Oxfordshire where the first Virgin artist, Mike Oldfield, recorded “Tubular Bells” which was released in 1973. The first album of the newly created Virgin Records went on to sell over 5 million copies. The equity of Virgin Music Group (record labels, music publishing, and recording studios was sold to THORN EMI in 1992 in a US$1Bn deal. Today, Virgin is one of the world’s most recognized and respected brands. Virgin Group has expanded into air travel, mobile phone service, financial services, rail, health & wellness, radio, hotels and resorts, space travel, and renewable energy investing through more than 200 companies worldwide, employing approximately 50,000 people in 30 countries. In 2004, Richard Branson’s dream of opening the world’s first ever commercial Space Tourism business was realized with the launch of Virgin Galactic. Based on the proven technology of Burt Rutan’s SpaceShipOne – Virgin Galactic’s SpaceShipTwo, the VSS ENTERPRISE will take its first customers to the stars. A child of the moon landing Richard has dreamed, as have many millions across the world, that the experience of space should be opened to all – as Virgin Galactic grows this dream will finally become a reality. 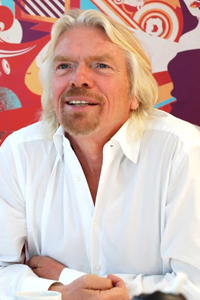 In September 2006, Richard Branson announced at the Clinton Global Initiative that all future proceeds of Virgin Group’s transportation companies will be invested into renewable energy initiatives. Richard believes that all businesses, especially those involved in transportation, energy and particularly fossil fuels such as coal, must be at the forefront of developing environmentally friendly business strategies with a focus on replacing traditional energy with energy coming from renewable sources. This commitment is estimated to be US$3bn over the next ten years. In February 2007, Richard Branson announced a US$25mn prize to encourage a viable technology which will result in the net removal of anthropogenic, atmospheric greenhouse gases. In July, on his and Nelson Mandela’s birthday, Richard joined Nelson Mandela, Graça Machel, and Desmond Tutu to help announce the formation of the Elders, a group of leaders who aim to contribute their wisdom, independent leadership and integrity to tackle some of the world’s toughest problems. Richard Branson is also putting significant focus into Virgin Unite, the independent arm of the Virgin Group that focuses on entrepreneurial approaches to social and environmental issues. He is supporting a number of efforts with on the ground partners ranging from the creation of sustainable health clinics in Africa to the fostering of new entrepreneurs through the Branson School of Entrepreneurship in South Africa. In December 1999 Richard Branson was awarded a knighthood in the Queen’s millennium New Year’s honours list for “services to entrepreneurship”. He is married with two children.